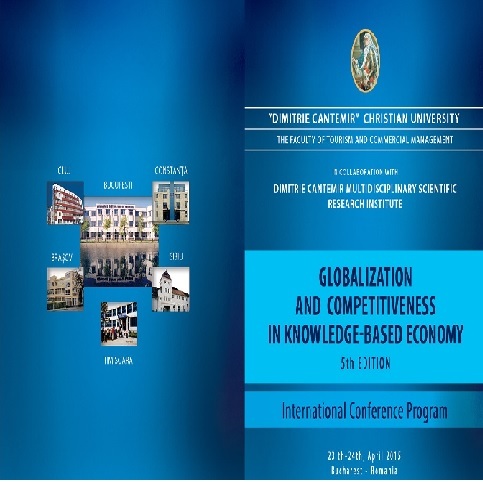 On behalf of the staff of the Faculty of Tourism and Commercial Management, we have the pleasure of inviting you to attend the 5th International Conference on „Globalization and Competitiveness in Knowledge-Based Economy” http://gcke2015.ucdc.ro/, that will be held in the University campus from Splaiul Independenţei no. 176, between 23rd -24th of April 2015. Hoping that you will honour us with your participation, we offer you some information of general interest about this event. Nowadays specialists in various fields of activity are focusing on issues connected with globalization due to their great impact on the development of national economies. Due to globalization, Romania has started a number of reforms by means of which prices and markets have been liberalized, foreign trade control has been reduced, currency convertibility has been introduced and changes have started to be made in the ownership structure, all leading to increased competitiveness. Therefore, ensuring competitiveness is a major priority not only for companies, organizations and individuals, but also for the academic environment. Direct foreign investments are perceived as an important and essential element for the process of changing and re-launching the economy, representing the main catalyst necessary for market economy and increased competitiveness in Romania. In the 21st century, the flow of direct foreign investments has greatly developed due to the massive expansion of transnational corporations – main elements of the globalization process. Last but not least, due to the great development of commercial exchanges between countries, foreign trade has become one of the key factors for economic growth. Under these circumstances, we can consider that globalization and competitiveness represent the greatest challenge of our century, most specialists considering that Romania’s own survival depends on the way in which these concepts are put into practice. Benefiting from a particular scientific prestige and large national attendance, the conference that is now at its second edition, aims at providing the framework for relevant scientific debates concerning the challenges that “Globalization and competitiveness in knowledge-based economy” raise for any economist or researcher in the larger field of Economics. Cooperating with other local and foreign faculties in order to develop a modern educational system and to establish connections with other universities. Approaching the issues related to the evolution of economic processes in the contemporary society, the empirical and analytical exchange, establishing partnerships for drafting and monitoring economic policies. Establishing and developing partnerships at national and international level as an instrument for raising the performance level regarding scientific research.